Barbaric and Ricochet are getting married! I dunno who they are, but apparently they’re important. Alas, their marital bliss gets off to a poor start when a swarm of villains crash the festivities. 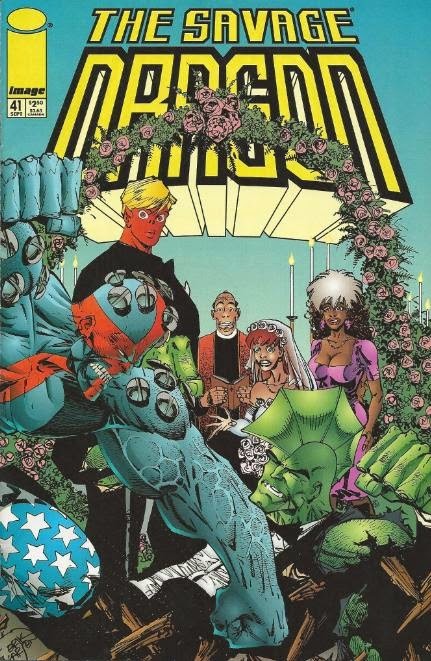 A brawl between what must be a hundred indie comics characters ensues (including the Teenage Mutant Ninja Turtles, who made the guest list), but it is quickly quelled by Ricochet, who tells everyone to shut up, sit down and enjoy the wedding. Everyone shuts up, sits down and Barbaric and Ricochet are properly hitched. The Turtles, unfortunately, warrant rather cheap seats, as they’re situated in the back of the crowd, crammed between Madman and the page fold. *Despite being printed a year earlier, this issue most likely takes place between TMNT (Vol. 3) #16 and TMNT (Vol. 3) #17, as that’s one of the few narrative breaks in the series where all four Turtles are together. *The Turtles last met Officer Dragon in TMNT (Vol. 3) #11. 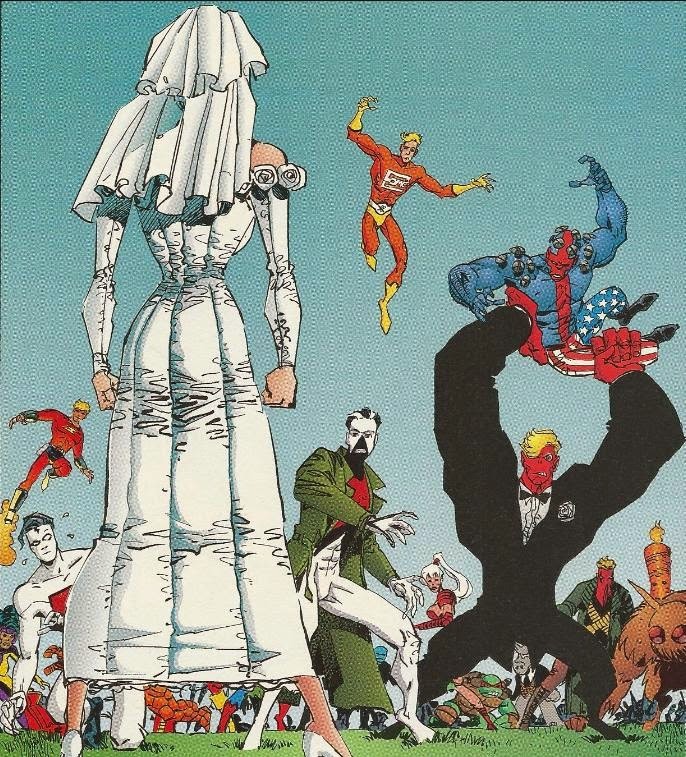 Sara “Horridus” Hill and Rapture were also attending the wedding and the Turtles (or just Michelangelo, rather) last met them in the same issue. 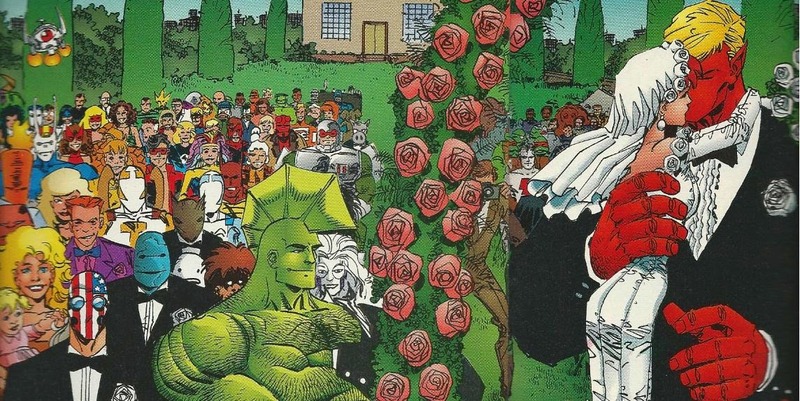 *Destroyer Duck is at the wedding and the Turtles last met him (in the guise of Specimen Q) in The Savage Dragon/Destroyer Duck #1. *Grifter of the WildC.A.T.S. is at the wedding, and the Turtles last met him in Shattered Image #2. *Cerebus is at the wedding. He’d previously encountered the Turtles, canonically, in TMNT (Vol. 1) #8, and non-canonically, in Miami Mice #4. *Flaming Carrot is at the wedding and the Turtles last met him (non-canonically) in TMNT/Flaming Carrot Crossover #4. Erik Larsen included pretty much every comic book character he could get to appear in this issue, and even a few he couldn’t (look for illegal cameos from the Hulk, the Sinister Six, Batman, Robin and more). Naturally, the Ninja Turtles were a given. While they’re reduced to nothing more than faces in a crowd for their two panels-worth of appearances in this issue, this is actually one of my favorite Image cameos from them, as it’s the only one where they’re drawn with their various “mutilations”. Their cameo appearances in Image books like Shattered Image #2 and Mars Attacks Image #1 have them all drawn in their traditional, nigh-identical character models. Larsen, however, remembers to draw them with the visual distinctions they’d developed over the course of TMNT (Vol. 3); Raph sports his eye-patch and Don is a cyborg. Other than that, well, nothing more to say about the Ninja Turtles’ part in this issue. Instead, I’ll just say that thanks to the TMNT and their many crossovers with the series, I’ve been developing quite an affection for The Savage Dragon. All the issues I’ve read have been highly humorous, and while oozing 90s comic clichés, it seems self-aware enough never to take itself too seriously and revel in said clichés. I may have to start back issue bin diving for random issues, as Savage Dragon is always fun reading. Savage dragon is one of my Favorite comics I got into it thou the TMNT crossover it's really best to read it form the beginning. Also are you review The TMNT Savage dragon toy pack in comic? I think that's the last TMNT/Dragon comic out there that I haven't reviewed yet. Since I own it, I might as well knock it out just for kicks. Also, Flaming Carrot is at the wedding, and he encountered the Turtles in issues #25-27 of the Dark Horse run of his series, as well as a 4-issue full color miniseries from Mirage with art by Jim Lawson. I wonder if those crossovers could be considered part of the Mirage canon? Maybe they take place after vol. 4, since in the color miniseries IIRC the Turtles were hired by the government to aid Flaming Carrot and the Mysterymen. So Hellboy *did* occupy space with the Turtles after all! Fascinating. Also apparently reading the copyrights, Knight Watchman was in this too?